Product with advanced characteristics from Borma wachs sales range. Bleach represents a specific product based on organic compounds, whose application provides lightening of wooden substrate. Carefully chosen combination of ingredients provides easy and quick achievement of the desired effect. Bleaching process can be repeated several times until the desired shade of the substrate or wood is accomplished. 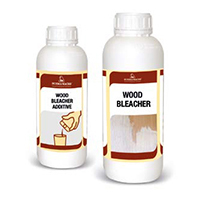 The new bleach is recommended for bleaching of different types of massif wood. The mixing ratio of components: 1 : 0,5. The product is applied using a flat brush. Bleaching level degree of treated surface is regulated by additional dilution of the product with water (by increasing the percentage of water in the mixture, the degree of bleaching is lower). The treated surfaces, 48 hours after application of bleacher, may be over coated with waterborne, acrylic or oil-based paints. Practical packaging of products – set 1 + 0,5 lit provides simple manipulation during bleaching procedure. Packaging resistant to the corrosive effects of bleacher (the product can be stored for a longer period of time without the risk of degradation ). Safer to handle than standard bleachers available. Additional treatment of surfaces, which are pre-treated with bleacher, using a polyurethane coating is not recommended ( especially because it may intense additional coloring of the substrate caused by a chemical reaction of the resin coating, with the remaining bleacher ). During the application of bleacher, it is necessary to thoroughly follow the instructions for use that are defined in the technical documentation of the manufacturer. When working with bleacher, it is necessary to use protective equipment. For additional information, please contact Fabbrica Technical service.